Cache Creek is one of the most representative casino resorts in Northern Cali. It is located in Capay Valley, north of Sacramento. The resort was initially opened as a bingo hall, back in 1985, but in 2002 it was refurbished and turned into a casino resort. Card games have been offered since 1993. The hotel has 200 rooms and the gaming space is 74,270 square feet. Cache Creek also features a 9 restaurant, a multi-purpose event center and a luxurious spa. If you’re a fan of golf, you’ll definitely love this resort and its 18-hole golf resort. Cache Creek Casino’s gaming offer includes more than 2,300 slots, a 14-table Poker Room and a variety of table games, including Baccarat, Pai Gow, Texas Hold ‘em. There are over 120 casino tables. Cache Creek Casino offers three different Blackjack varieties and there are quite a few Blackjack tables. Moreover, if you’re a high-roller, you might want to consider playing Blackjack at the High Stakes Table Area where the maximum wagering limits may reach up to $10,000. This is the most common Blackjack variant. At Cache Creek the dealer hits on soft 17, players are allowed to re-split aces and to double after splitting. You may double regardless of your cards, but there is no surrender option. The table limits are pretty flexible, the minimum table limit may be as low as $5. It can also be $10 or $25, whereas the maximum wager is $5,000. The house edge for this game is about 0.57%, which is not the lowest house edge that you could get, but it is not very high either. In the double-deck version, doubling is only available on 10s or aces and you can’t double after splitting, you can’t re-split or surrender. The dealer hits in soft 17. The minimum wager for this game is $50 and the maximum amount that you can bet per hand is $2,000. The house edge for this version depends on how the dealer cuts the deck and may vary between 0.55% and 0.60%. Cache Creek is one of those casinos that offer single-deck Blackjack. Here the dealer is also supposed to hit on soft 17, doubling down is allowed only on 10s and 11s and you can’t re-split, double after splitting or surrender. 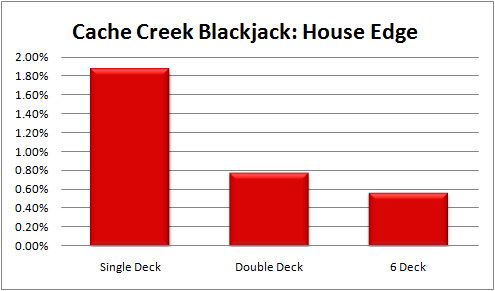 Knowing that single-deck Blackjack is the favorite version of card counters, Cache Creek introduced a 6 to 5 payment on Blackjack for this game in order to increase the house edge. The minimum bet for this game is $10, whereas the maximum amount is $500. In addition to the standard Blackjack gameplay, players at Cache Creek can spark things up by placing an extra wager on one of the most interesting Blackjack side bets, known as Lucky Lucky Blackjack. This bet is based on the first two cards of the player’s hand and the dealers open card. The three are taken together and if the sum gives either 19, 20 or 21, it is a winning bet. There is a range of winning combinations, but the highest scoring hand is a suited 7-7-7 combination, i.e. where all three cards are sevens of the same suit. This combination pays 200 to 1, but bear in mind that it is impossible if you’re playing double-deck Blackjack. A 6-7-8 suited combination pays 100 to 1, whereas the lowest paying combinations are totals of 20 and 19, both of which pay 2 to 1. Even though this casino offers variants played with fewer decks, you’ll still get the best odds on the 6-deck Blackjack. The dealer penetration isn’t the best, but there are casinos where the cut card is even less favorable. Even if you are a card counter, you can avoid the ‘heat’, as there are enough tables and you can move from one to another, but bear in mind that the dealers are, generally speaking, quite slow and that might cause you to lose track of your running count. Cache Creek Casino is definitely one of the best casino resorts in Northern California. It may not offer the best house edge, but it is still pretty decent. The table limits are flexible enough and suitable for both rookies and players who like to play on small stakes, as well as high rollers. Whether you’re a card counter or not, the best odds at Cache Creek Casino are on the 6-deck blackjack shoes. The dealer penetration isn’t great, but you’ll have dozens of tables to hop around on. Take advantage of as much back counting and backing out of negative counts as possible. You definitely don’t want to grind through every shoe that is dealt if you’re looking to make any significant money. Cache Creek blackjack is most easily beaten through the use of team play, so gather your card counting friends and get organized!